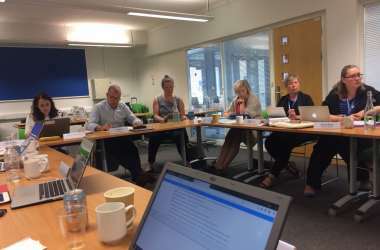 At a Partnership Review Event, held yesterday at Falmer Campus of the University of Brighton, plans to launch a Doctoral College at Wittenborg University Apeldoorn were approved by a panel who also carried out a Partnership Review into the collaboration between Wittenborg and Brighton. The proposed Master of Arts in Education, to be delivered at Wittenborg from September, was also approved. The Partnership Review takes place every five years and uses UK QAA standards to ascertain if the partnership is strong and robust enough, to guarantee students the quality and experience they could expect at a UK university. The review panel looked at quality systems, Wittenborg's numerous accreditations, staffing, student support, and much more. Wittenborg was represented by a team from Apeldoorn and Vienna, including Nicolet Theunissen, Head of Research, Dr Rauf Abdul, Head of the School of Business, Dr Alex Bauer, Vienna Campus Director, Esther Gitonga Bakker, Head of the School of Hospitality & Tourism, Myra Qui, Head of Process Tutoring and Peter Birdsall, Wittenborg's Chair. The Doctoral College will be a split site PhD programme, allowing students in Apeldoorn to complete a three year PhD doctorate programme awarded by the University of Brighton. The focus of these research programmes wil be in line with Wittenborg's 5 Schools, which have been in turn mapped to the research cores and values and research groups at the University of Brighton. The MA in Education was also approved for delivery at the event. According to Peter Birdsall, Wittenborg Director of Education" "The programme is aimed at practicing teachers or educators who will be able to fit their studies around their working experience in such a way that their learning will enhance their day to day work, which in turn will feed their research studies." Wittenborg University will start offering the PhD programme from September entry, and with 12 entry points per year will be recruiting students throughout the year, and the MA in Education will start in September with one entry.